It’s been a few weeks since Lijo Jose Pellissery’s Angamaly Diaries released, but people continue to be watching it and talking about it. There definitely seems to be something that has indeed gone right for the filmmaker who is definitely known for his fantastic sense of humour. Ask anyone who has seen one of his previous films, Amen (2013) and I am sure they would probably vouch for this. In his latest film Angamaly Diaries this point is even more emphasized. While the film does feature food as a vital element in the film, visible in the opening credits itself where we we see various popular food joints in the town of Angamaly and their signature dishes getting prepared, there is a lot more to this in the film. 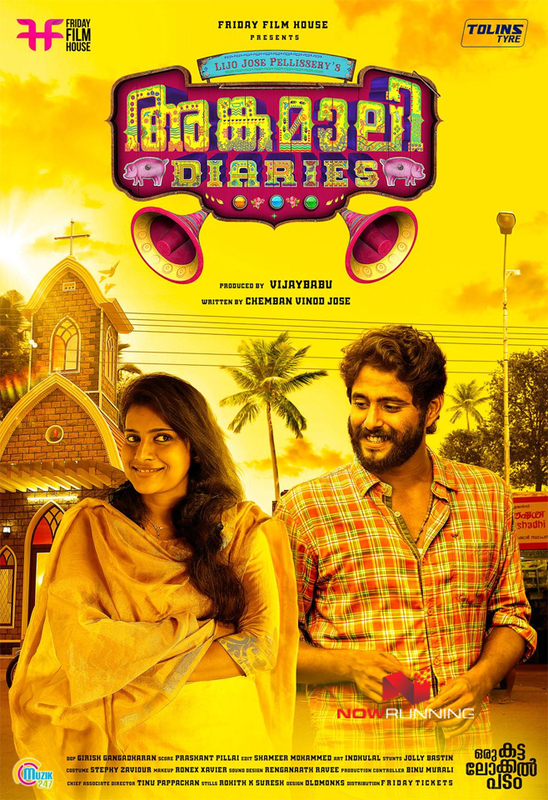 Have you ever thought of or described a romantic relationship in terms of a food combination, well if you haven’t then you need to check out Angamaly Diaries for sure. When Vincent Pepe and his first lady love Seema begin their relationship, Pepe describes their pairing to be as lovely as the popular combination of tapioca and egg. Later on they go on to break up and once again Vincent describes the change in the situation by mentioning that Seema realized that tapioca and pork make a better combination, thus finding someone better and moving to Singapore. Similarly Pepe realizes that egg and green peas make an awesome combination, so that’s how he has moved ahead himself in a relationship with Sakhi. This is just a sample, check out another scene where people have gathered at the funeral of a slightly overweight chap. His hands do not seem to fit inside the coffin due to a state of “rigor mortis” and seeing people struggle to adjust the body in the coffin so that they can place it in the electric furnace, 2 youngsters step in to help. They go on to do the needful, resorting to literally “breaking” the arms in the process, something that doesn’t impress the people around or the cops who give them a sound warning before letting them off. This scene is a fantastic example of the kind of dry sense of humour that prevails right through the film. 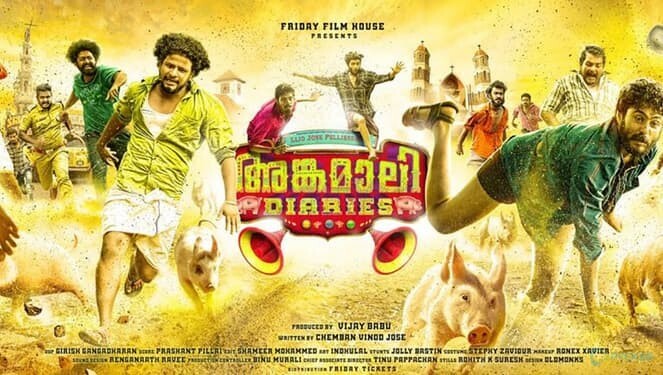 Coming right after the colossal failure of Double Barrel, something that seemed to be a tad too extravagant in terms of an experiment within the commercial space, the announcement of Angamaly Diaries did take people by surprise. Also clearly signalling that he had definitely moved on, perhaps heralding a positive development. What was surprising is that Angamaly Diaries does not have a single known actor in the film (except for a one scene appearance by Chemban Vinod Jose who plays himself), Lijo has gone on to introduce 86 new actors in the film. With Angamaly Diaries Vijay Babu has gone on to turn solo producer as well under his Friday Film House banner. Of course we have had many films in the past paying tribute to a particular place, but here Lijo moves quite a few steps ahead as we realize that the town of Angamaly ends up being a character in itself in the film. Hence whenever you hear of characters uttering “njanum oru Angamalykkaran aane” (I am also a resident of Angamaly) in the film, you know that it’s being said with a lot of pride. In the bustling town of Angamaly, not far away from Kochi we are introduced to the Palliyangadi team of youngsters that’s headed by Vincent Pepe (Antony Varghese), a youngster with big dreams and a natural leader as is seen clearly. He has concrete plans to move ahead in life and do well to secure a good future for himself and his family. In the process he is keen to marry his girlfriend Sakhi (Binny Rinky Benjamin) and shift to Germany. 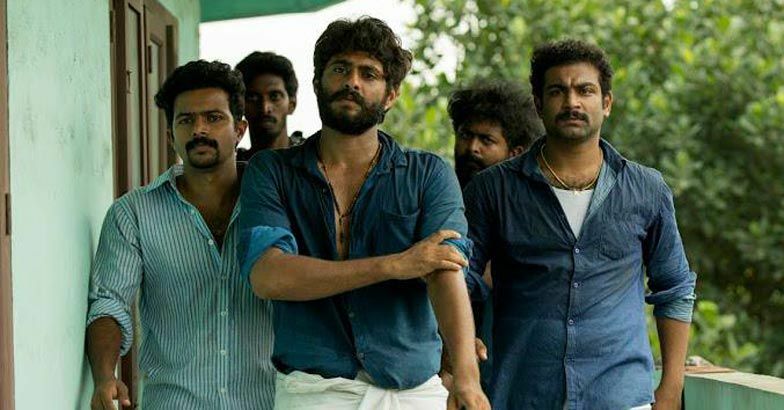 In the meanwhile on realizing the business potential associated with selling pork in Angamaly, Pepe and his friends get into the business, in the process they go on to cross paths with the hot headed brothers Rajan (Tito Wilson) and Ravi (Sarath Kumar). But here is when fate intervenes, right at time when everything seems to be going right for Pepe and his friends. They are taken aback by an unexpected situation catching all of them totally off guard and throwing their lives into disarray. What makes an otherwise cheerful group of youngsters stray down into a dangerous path? What happens to them from thereon and how does the tale culminate eventually are what we get to see to see as the film proceeds further ahead. For Angamaly Diaries Lijo Jose Pellissery has teamed up with actor Chemban Vinod Jose who turns writer for the first time. Chemban Vinod has gone on to really impress with his writing and he has worked well in tandem with Lijo who ensures that the writing gets executed wonderfully on screen. Usually whenever a director and screenwriter click in combination like this, the output becomes something worth anticipating and that is true in case of Angamaly Diaries as well. While the writing ensures that there is an undercurrent of humour throughout the film, it remains subtle and never overrides the grim tone at any point of time. Technically the film is a delight, Gireesh Gangadharan’s cinematography brings alive the various hues and shades of the locations of Angamaly. In particular I would like to single out the grand finale which appears to be a single take shot; the way it’s been conceived and executed with such a huge crowd around makes it even more special. With a run time of 132 minutes, the film moves at quite a rapid pace, Shameer Mohammed’s work on the edit table definitely proving to be an advantage for the film. Prashant Pillai’s music (both in terms of the songs and the BGM) is a huge reason for the film’s success,complementing the mood and the feel of the film. In particular adopting a brass band style at many places adds to the novelty for sure, like the brass band version of Ilaiyaraaja’s “Ilamai Idho Idho” (from Sakalakala Vallavan-1982) during a crucial fight sequence. It’s certainly not an easy task to make a film with a totally new set of actors, and to do so with 86 of them around, most of them getting to register an impact as well is no mean feat at all. Kudos to Lijo and the people involved in the casting process, and it’s definitely very inventive of Chemban Vinod for the kind of unique character names that he has come up with for the film. Among the actors who leave a big impression are Sarath Kumar and Tito Wilson who play Ravi and Rajan with perfection, Ullas Jose Chemban as the SI and Bitto Davis as “10 ml” Thomas. Reshma Rajan is fantastic as Lichy, in fact it’s quite a refreshing character, easily among the better female characters that one can come across in Malayalam cinema of late. Antony Varghese is a good find; he makes a confident debut as a leading man in the film. Angamaly Diaries is an extremely spirited attempt by Lijo Jose Pellissery, this one is easily among the best of Indian Cinema of 2017 so far. Yet to watch it, what are you waiting for?